This Sturdy Sign Supply For Outdoor Use Can Stand Up To Heavy Weather! 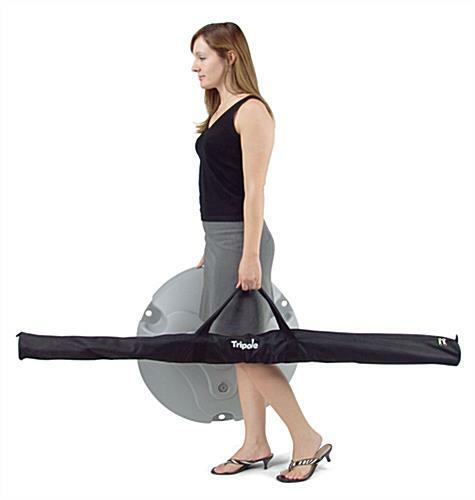 Easy to Use and Portable! In Stock In Our Quick Ship Warehouse, So Don't Delay! The TriPole is a sign supply that is over 13ft tall. This sign supply is engineered to fly a 31-1/2"w x 94-1/2"h flag in winds up to 31 mph. This sign supply is a better choice than a traditional flag pole or windsock! 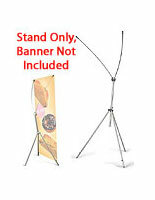 A support arm assures that the marketing flags stay open and viewable even in circumstances with little or no wind. No droopy bunched up flags at this site, the flags remain open and extended. This sign supply is greater than an outside moveable pop-up display! The publicizing flags are free to revolve around the flagpole with the wind. This produces appealing mobility and permits the TriPole to perform in greater winds than other displays. This portable sign supply designed for exterior use consists of easy to carry and long-lasting metal poles and a molded polymer base. Other marketing publicizing flag showcases, like flagpoles and outside banners, must be driven into the ground or utilize a car for support. Driving anything into the ground is usually a dangerous assignment due to buried power, gas, or water lines and it is not always desirable or viable to place a vehicle under your ad. The molded base accommodates eleven gallons of water or sand and is effortlessly filled via the topside hole. The three supporting legs distribute wind forces to the base and preclude falling over. 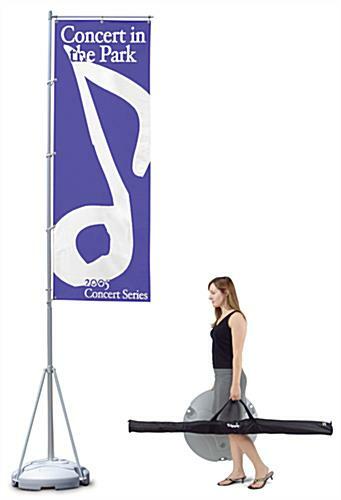 The easy to carry metal sign supply that features a flagpole can be setup and raised by one human body. The flag support arm stretches alongside the topside of the marketing publicizing flags to make sure they are constantly observable, even in little or no wind. A weight is suspended from underside grommet of the flags and assures that the publicizing flags are constantly extended. Included with this sign supply is the TriPole publicizing flag pole and pole transporting bag. The black nylon transporting bag has a zipper alongside the complete length and padded ends. A removable zipper pouch is inside the bag to accommodate the flag attachment tools. Buy this sign supply online not only because it is large, but because it is large and moveable. Our company effortlessly put six of these in the back of a midsized SUV with area to spare. 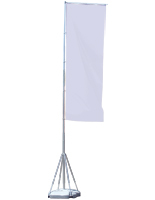 The three piece telescopic flagpole collapses to merely 59"long and the easy to carry base has a transporting handle molded into the underside. Please Note: When leaving units outside for extended periods of time water level in the base should be monitored frequently. Printed advertising flag Not included.